in the state of Connecticut, where the temperatures today are below freezing and there's a good chance of snow tomorrow. The cold weather didn't stop Michael Sperber, Chair of Connecticut FIRST, from contacting us to tell us about how his organization uses Docs for event management, alumni outreach, and event surveys. Connecticut FIRST is the Connecticut arm of FIRST, a not-for-profit organization that organizes robotics programs and competitions for young people ages 6 through 18. Young people are exposed to math, science, and engineering as they build their robots. Working in teams of at least 25 and guided by adult mentors, participants develop life skills such as teamwork and leadership. 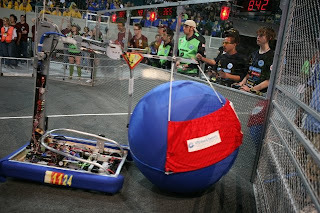 The Connecticut organization has 33 FIRST Robotics Competition program teams consisting of over 1,000 high school students. Students are now busy building robots to compete in Lunacy, a competition where robots will have to navigate a low friction surface that simulates driving on the surface of the moon. Cool! A volunteer coordinator tracks volunteer contact information in an online spreadsheet. For an upcoming event, the leadership team has shared a spreadsheet to track invitation lists for VIPs. Michael told me, "Instead of sending attachments, it's much easier to do this online collaboratively." They've recently discovered Forms and in the near future will be creating surveys to collect information from alumni to help build their alumni network. To learn more about FIRST and its volunteer opportunities, visit the volunteer opportunities page. We continue our non-profit series in the state of Connecticut, where the temperatures today are below freezing and there's a good chance of snow tomorrow. The cold weather didn't stop Michael Sperber, Chair of Connecticut FIRST, from contacting us to tell us about how his organization uses Docs for event management, alumni outreach, and event surveys.